The November Dance performance of the University of Illinois dance department is dedicated to celebrating the life of Kate Kuper, lower right. Kuper was a faculty member in the dance department who directed its Creative Dance for Children program. CHAMPAIGN, Ill. — Dance students at the University of Illinois worked with Latvian choreographer Olga Zitluhina on a new dance piece that will be performed at November Dance, Nov. 9-11 at Krannert Center for the Performing Arts. Zitluhina, the head of contemporary dance at the Latvian Academy of Culture, spent a two-week residency with the dance department in September as part of an exchange program. The U. of I. is one of two universities participating in GPS/ Global Practice Sharing, a consortium of artists and organizations supporting cultural exchanges between the U.S. and Eastern Europe. 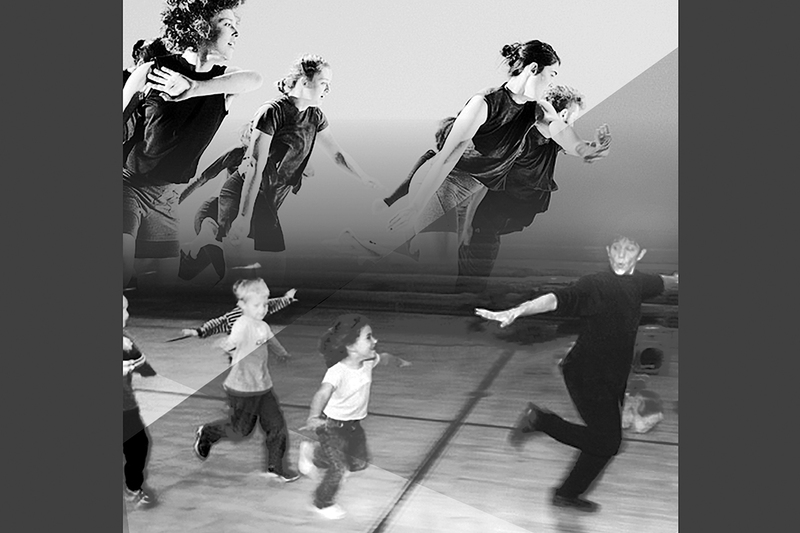 It is a program of Movement Research, a New York City-based organization that offers programs to support creativity, experimentation and performance opportunities in dance. In 2016, U. of I. dance professor Abby Zbikowski taught contemporary dance at the Latvian Academy of Culture as part of the exchange program. Zitluhina’s dance that she developed with Illinois students questions why life moves so fast and why we produce so much and then throw heaps of it away. In “Just Enough,” she looks at what it means to exist in the moment. It starts with dancers entering a bare stage and beginning to move. Little by little, the wings and backdrop of the traditional proscenium stage are set and the music begins. The stage now appears ready for a performance, although the dance has been happening all along, said Rebecca Nettl-Fiol, the rehearsal director for “Just Enough” and the concert director for November Dance. This fall’s November Dance is dedicated to celebrating the life of Kate Kuper, a faculty member in the dance department who passed away in November 2016. Kuper directed the dance department’s Creative Dance for Children program and also taught the Dance for People with Parkinson’s program at Krannert Center for the Performing Arts. “We felt moved to dedicate the concert to her,” said Nettl-Fiol, a longtime friend of Kuper. In addition to Zitluhina’s work, November Dance will include a piece by dance professor Jennifer Monson, a choreographer and performer. “Tuning the Turn” is a work for 10 dancers that is described as a companion piece to the evening-length duet “bend the even,” featuring Monson and graduate student Mauriah Kraker, which will premiere in New York City in February. Monson and Kraker worked on material for “Tuning the Turn” during pre-dawn rehearsals at Barnhart Prairie in Urbana, using the light emerging at daybreak as inspiration. The choreography uses repetition, vibration and vocalizing, and is accompanied by music from experimental harpist Zeena Parkins and sound artist Jeff Kolar. Other works in November Dance include “Pyrolysis” by graduate student Charlie Maybee, which pushes the boundaries of tap dance by imagining a dancer who can use the friction of her shoes to create fire; “As such, or not” by Kraker, which she describes as a “structured, improvisational practice;” and “where we’re going” by undergraduate student Krystal Collins, which expresses the rhythms of black social dances and the childhood games of African-American girls. Editor’s notes: For more information about November Dance, contact Rebecca Ferrell at rferral@illinois.edu. Information and tickets are available online at https://krannertcenter.com/events/november-dance-celebrating-kate-kuper.